Finding verandas or varandas in India delighted the European explorers of the 16th Century. They saw that they were used both as a sophisticated way to keep the temperature down inside a building and for defining an area to be used for relaxation and entertainment. It is this aspect of the veranda which has made it important in the west in the 21st century as we find ourselves with more leisure time compared to previous generations. 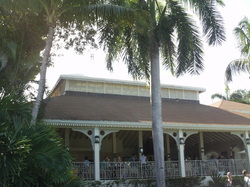 The development of house construction has also impacted the veranda. Originally people lived in huts with beaten earth floors. The area around the hut would have been built from raised earth with an overhanging roof to throw water and sunshine away from the house itself. As building methods improved and people became wealthier decking was added around the house to provide a clean wooden area to sit and walk on. This decking became the foundation for posts supporting the roof and the balustrades which were placed between the posts to keep people from falling in or out. American and Colonial homes are full of this type of design. The industrial revolution made materials like cast iron, steel and aluminium much more affordable. Metals are much stronger than wood it became possible to make structures which could support the weight of many of people using the new technology. It was also possible to create very intricate and detailed patterns with aluminium and cast iron to decorate the veranda and the balustrades which surrounded them. We know this as Victorian lacework and the Victorians built lovely verandas out of these materials many of which are still in existence today. On the other side of the world the Australians also took to the idea of verandas. The concept suited their climate. Their vernacular architecture started with a house surrounded by a covered deck but as modern materials and methods gathered pace this system which had been so effective for so many years in so many places was replaced by “good design” which did without the veranda. Only later was it discovered that a house which looked modern and therefore had “good design” was not as effective at providing a cool environment inside. 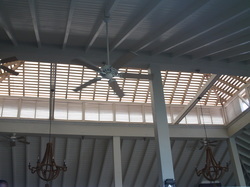 The Veranda gives shelter from both the rain and the heat but it does not let light through its roof. Look at the image to the left and you will see a really great illustration of how the light in a roof can be allowed to percolate through to give a wonderful atmosphere in the room below. It is achieved using a wooden structure and tarpaulin! So simple but so effective especially for a tropical environment with very strong sunshine. The modern glass veranda tries to achieve the same light filled space in a temperate climate using clear glass rather than translucent tarpaulin. The industrial revolution not only produced aluminium and iron in abundance to enable the construction of the Victorian verandas but it also saw the creation of glass in large quantities. Window panes could now be manufactured for fitting into buildings which needed glass roofs. To start with only a few of these were built and they were the preserve of the very rich. We no longer wonder at the total extravagance of the original Crystal Palace or the glass houses at Kew Gardens but in their day they were constructed at huge expense to show off the wealth of the nation. As glass manufacture improved in the 20th Century safety glass was used in places which were vulnerable to breakages. This safety glass was manufactured with wire inside it to prevent large chunks of sharp glass cascading down onto people underneath should it break. This glass was still very expensive and glass roofs which were made of it were still only available to the very rich. Buckingham palace has one in the quadrangle to shelter visitors as they arrive. Wealthy people had garage forecourts covered with glass roofs to protect them as they got into their new and very expensive motor cars and roof lights were installed in large country houses to let light into their inner recesses. It took the advent of toughened float glass with the huge price advantage it had over the wired safety glass to start a revolution in roof lights, conservatories and glass verandas. Another influence which brought about the advent of the Glass Veranda in England was the lack of planning freedom in connection with the building of house extensions. These restrictions produced a boom in the erection of conservatories. In many ways these conservatories were ideal because they could be built onto an existing house and they didn’t steal the light from the rooms connected to them. They did have their drawbacks. They were too cold in the winter and too hot in the summer. People began to realise that conservatories without sides would create a different way to enjoy their outside space. The result of these developments is the modern Glass Veranda with its elegant powder coated aluminium posts and glazing bars supporting a toughened glass roof. It makes for a completely useful space next to the English home and is perfectly suited to the variable English weather. On a recent visit to Arizona I saw a glass veranda with "clear" solar panels installed on its roof. This is a wonderful way to enjoy shelter from the sun as well as using space effectively to generate power for a home or an office. Have a look. We would do this a bit better and powder coat the metal structure, but the principal is good should you want to go down this route for installing solar panels on a glass veranda. This particular array of panels was huge and the owner said that it generated 66 Kw, a very impressive output even in the hot Arizona weather.